Between Here and the Machine presents the work of three West Coast artists whose practices contemplate the ubiquity of mediated images. 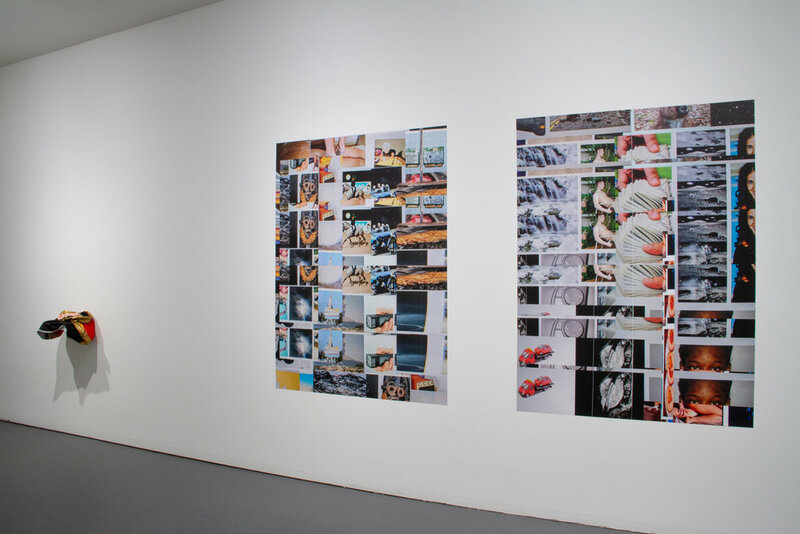 Working across analog and digital forms, Bean Gilsdorf, Rhonda Holberton, and Anthony Discenza negotiate spheres of image production and distribution in order to expose and subvert their operations. Gilsdorf exhumes "dead" images from mass-media history books, reanimating them as meticulously assembled soft sculptures. Holberton challenges the aesthetics of platforms such as Instagram by restaging its operations with her own possessions using low-fi 3D modeling tools. Discenza’s randomized image-search composites, produced on his phone, suggest a new kind of visual space shaped less by traditional compositional strategies than by the inhuman logic of the algorithm. In each case, the image-space that each artist addresses represents layers of processing—technological, cultural, political—comprising a vast continuum of visual production and manipulation; the works in Between Here and the Machine all bear the marks of their long passage through this space. 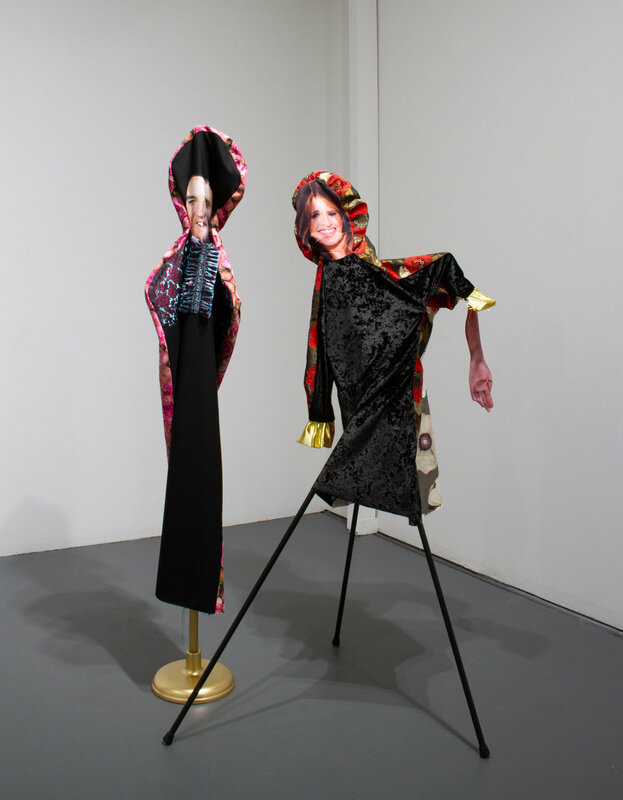 Bean Gilsdorf, Left: Thin King, 2018, Wool, polyester, brocade, cotton, wood, paint, flag stand, approx. 72 x 12 x 12 in. Right: MT, 2018, Velvet, cotton, polyester, chenille brocade, wood, paint, approx. 66 x 37 x 29 in. Rhonda Holberton, Left: Lilium Candidum, Rosa 'Madame A. Meilland’, Alstroemeria (Night I), 2018, Archival Pigment Print, 28 x 39 in. (framed), ed. of 3 + 2 A.P. Right: Lilium Candidum, Rosa 'Madame A. Meilland’, Alstroemeria (Night II), 2018, Archival Pigment Print, 28 x 39 in. (framed), ed. of 3 + 2 A.P. Anthony Discenza, Image Search Composition 106702 (Processing set), 2018, folder of 149 high- resolution digital image files, generated between 11/15/2018 – 11/22/2018, (shown on 10.5 inch iPad Pro, 2017 version), ed. of 3 + AP. Bean Gilsdorf, Golden Boy, 2017, Fabric collage with wool, polyester, lycra, pins, 26 x 24 in. Rhonda Holberton, A / fisherman / hunts / a / shark / with / a / gun, 2017, Archival Pigment Print; 36 x 29 in. (framed), ed. of 3 + 1 A.P. Bean Gilsdorf, Memphis, 2018, Wool, polyester, velvet, spandex, cotton, wood shelf, 12.5 x 19 x 12 in. Anthony Discenza, Left: Image Search Composition 2831-1542165551477, 2018, Digital output on 3M Control-Tac vinyl, 67.7 x 50 in., ed. of 3 + AP + temporary exhibition copy. Right: Image Search Composition 3140-1539913076358, 2018, Digital output on 3M Control-Tac vinyl, 67.7 x 50 in., ed. of 3 + AP + temporary exhibition copy.